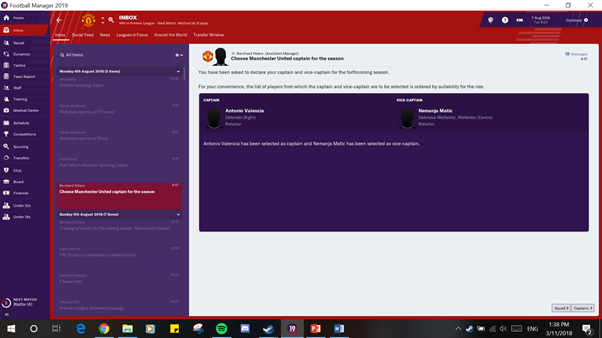 Playing with the no brexit mod, let's see how much I can emulate Sir Alex Ferguson, or at least emulate his success. Welcome to my Man Utd story. In this series my target is to emulate Sir Alex Ferguson and to develop lots of youth players which is one of my favourite things to do on FM. 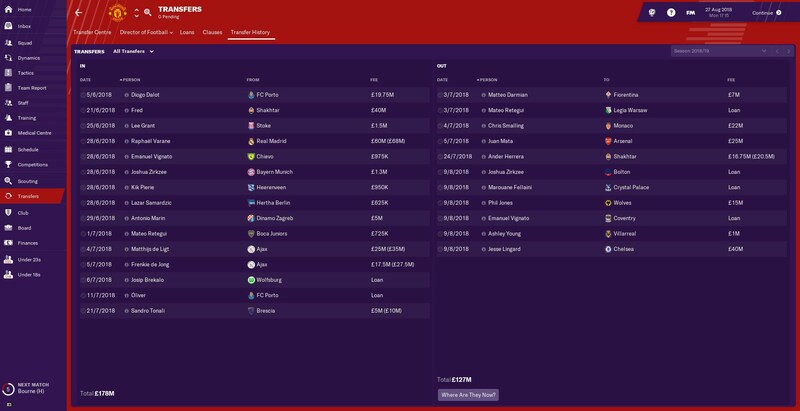 So I won't necessarily be wasting my whole budget on Neymar or something, I'll be spreading it out with some good players as well as youth players. 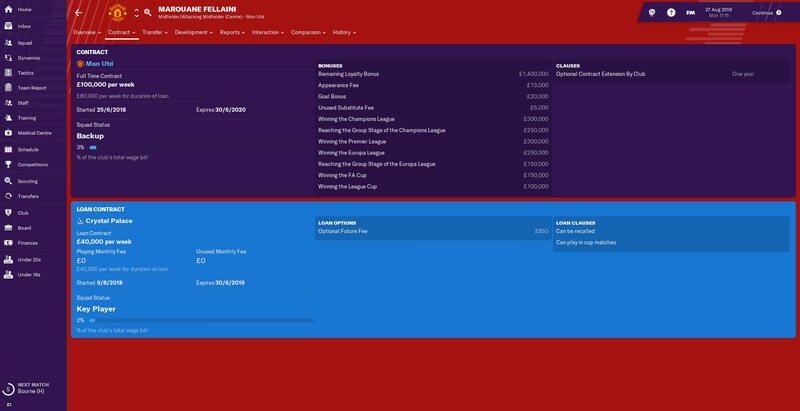 As soon as I get to near the start of the EPL, I will post because I might still have a few more transfers planned. Welcome! 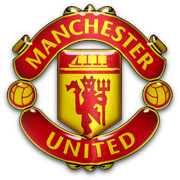 Wish you well with United, hopefully you can get the team I support back on top! He has an optional future fee of £865 haha. We have too many good centre-backs at the club that he was 5th choice. 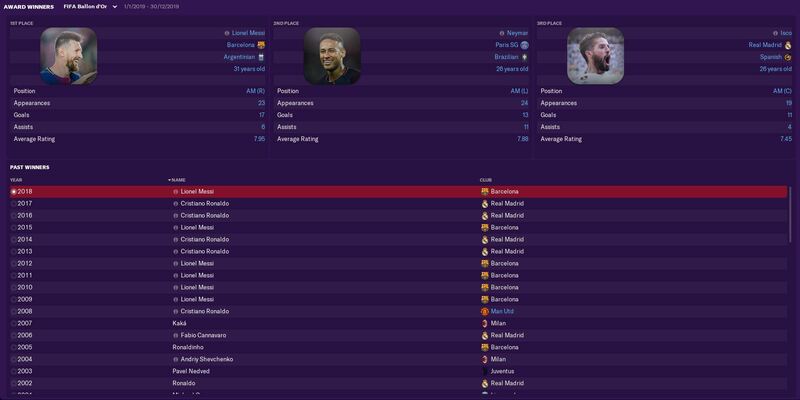 I didn't want to sell Jesse but I promised him if Chelsea offered £40M, I'd sell him and looks like they did exactly that. Anyways it may have turned into a blessing as you will see in future transfers. 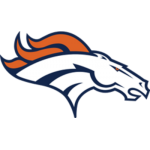 I thought he was going to sign this season but it was too late when I noticed it was going to go through at the end of the season. Hopefully, he has a good season at Dortmund. Used from most of the funds of the Jesse Lingard sale, Filip is one of the best young centre-backs and we've managed to get him in for a hefty price tag, but he does add to my wanted Croatian contingent of young players right now. We had a flurry of transfers on deadline day but it went very well on that day. 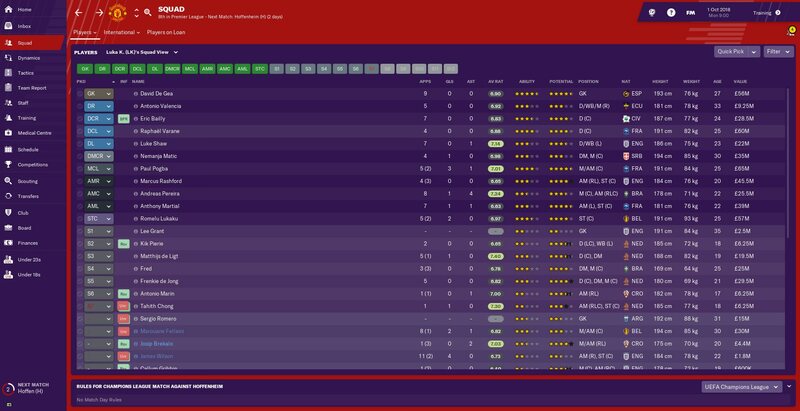 Overall, I am very pleased with our transfers as we got plenty of talented young players and the even better thing is that most of them we're bargains like Kik Pierie and if some of them can't make it, we can at least make a profit on them. I'd recommend uploading them to Imgur and using the 'picture' (see screenshot) icon to put them up on here. 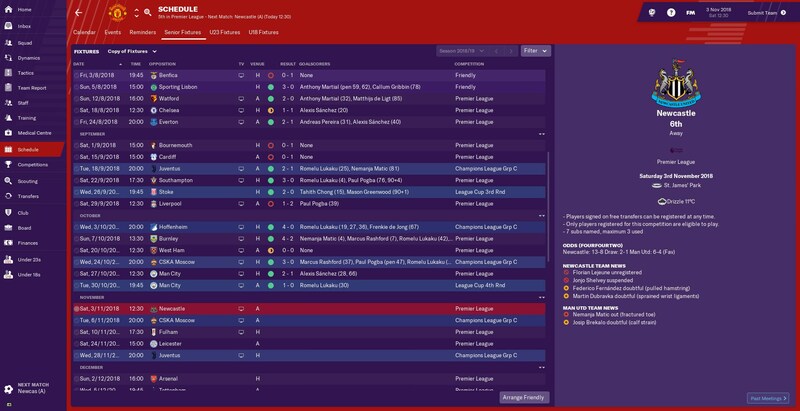 Not the most successful pre-season, especially since everybody was on holiday until a few days before our first game which means I'll have to build up some of their match sharpness. After the first 6 games, we went unbeaten and then went winless in the last 5. Good thing was that the youth got some chances against big teams. As you can see in the above photos, we played our very first competitive game against Watford where Martial got a goal for his tally while de Ligt got a very special debut goal. 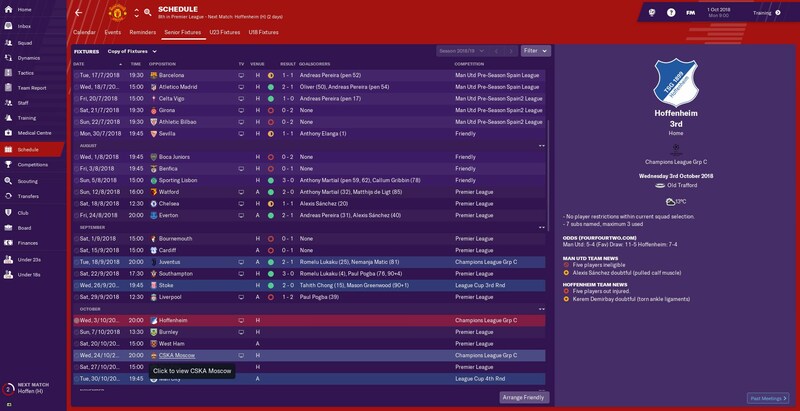 In only our 2nd game, we had Chelsea at home, which was my manager's first match at Old Trafford and we got a 1-1 draw which I'll settle for, especially in the early stages. Next up was especially a more tricky match than originally thought against Everton but Andreas Pereira who has been playing so well got the first goal and Alexis got the 2nd. This is the lineup for our very first competitive match vs West Ham. de Ligt and Fred are making debuts in a strong line-up. Antonio Valencia stays as our captain while we appoint the experienced Nemanja Matic as our vice-captain. Your images aren't working for some reason. Upload them to Imgur, then click on share links and copy the BB Code section into your post and it should work! Are my images not coming up or are they low quality? Thing is they're coming up for me now after it previously wouldn't but if they're not coming up for you then I probably need to fix something. Is the bottom spoiler working? I probably should use the steam screenshots too since that might bring better quality than computer screenshots. Welcome. 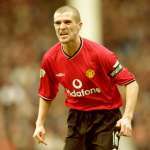 Hopefully the start of a long and successful career with Man U. As for the images make sure they're still in your Imgur library, they say they're unavailable in your posts so maybe they've been deleted. If you've move them to another folder then you'll also have to relink them here. Ohh, so if they're deleted they won't show up. Well, I kinda deleted everything when i was done lol. Do I have to share to the community on imgur because it says I've been sharing too quickly and then each time that happens the cool down is longer. I don't think so, the spoiler image worked but the image quality is low. I upload them to Imgur, pretty sure my account on there is private so (I think) all you need to do is upload them and keep them uploaded, then link them. I think I need to use steam screenshots to get better quality but I don't think I can get screenshots for some of the others. That's a shame, but as long as you can do it for future updates then it'll be cool. Your Imgur account does not have to be private or not jus the images need to be stored in your library. As you've deleted them that'll be why they're not showing. 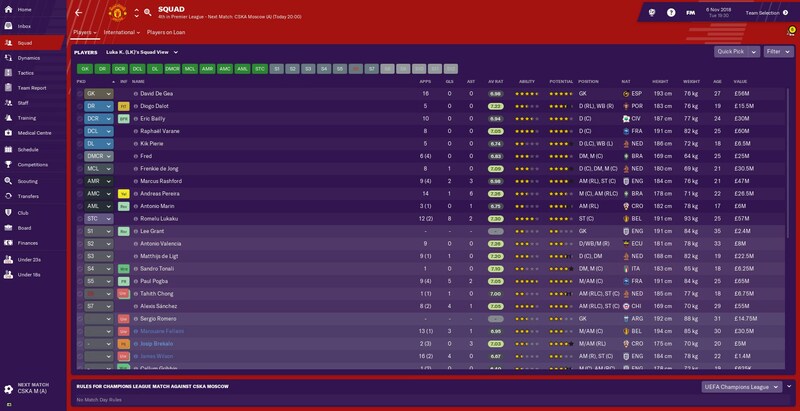 That's a crazy amount of transfers in one season. Has you considered how Brexit will impact your squad? You've moved on a lot of "British" players: Smalling, Mata, Jones, Young and Lingard. I'm sure Herrara and Fellaini take on British passports in the second season too. I'm playing with no brexit mod as I want to enjoy a save without Brexit in it before Brexit is completed irl. Fixed all the screenshots now and I've figured out how to do these stories now. 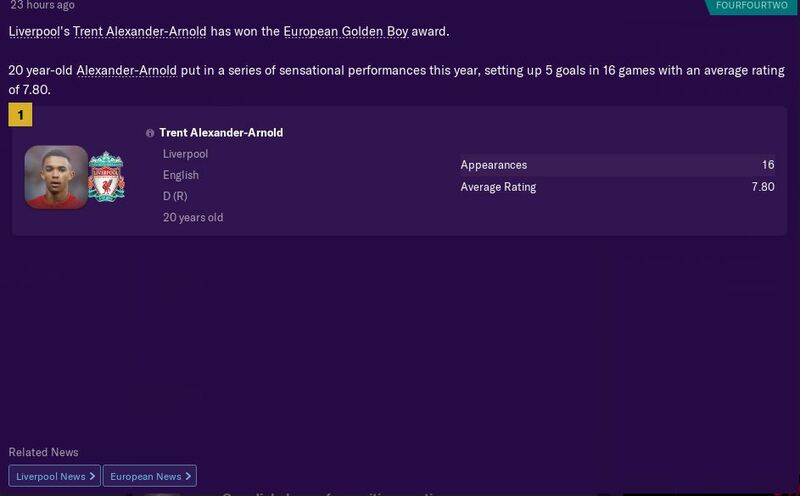 If you got any suggestions of a side-save like an international save make sure to leave it in the comments. Hopefully we can have October soon but it seems like I'm going to be having a busy 2 weeks but after that I'm fine. Although Salah is the deserved winner, it's nice to see Andreas Periera make top 3. In my eyes, we've been blessed with a good group in the Champions League, not too easy to the point where we won't be challenged and not have any experience against big teams in the knockout but not too hard we're it becomes group of death. 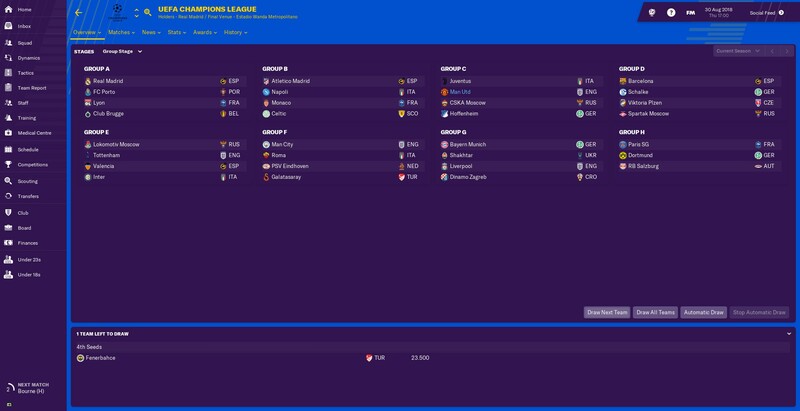 With Juventus in our group, to get a result against them would be perfect practice for the latter stages and we'll still have to play good games against CSKA Moscow and Hoffenheim. We should be able to make it out of this group unless we end up in a crisis. 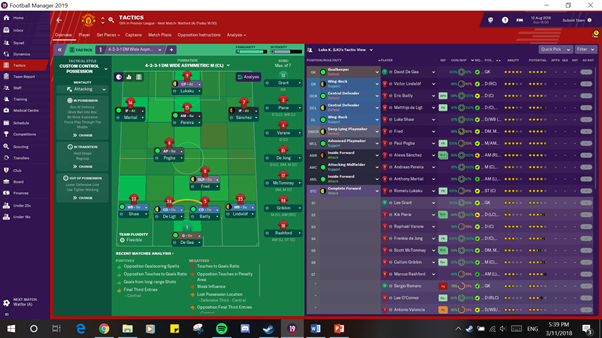 Atrocious start to the month but I fixed the transition part of my tactic ahead of the Juve game and now it's working wonders . It's good to see Romelu Lukaku is gaining some form up top as Martial and Rashford aren't playing so well. Then followed the Southampton game in which Romelu Lukaku starts to add to his tally and Pogba starts to gain some amazing form. After getting 2 goals and 1 assist, Pogba took out the deserved man of the match award. Next up was the League Cup 3rd round vs Stoke City with a heavily rotated lineup as we had plenty of youngsters in the lineup. 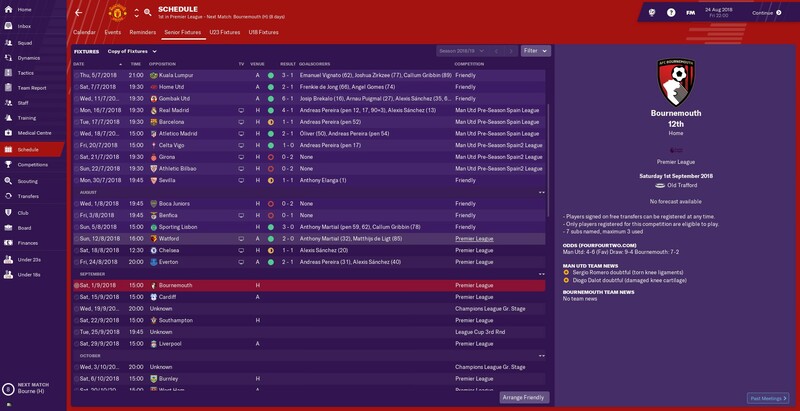 We won that game 2-0 as Josip Brekalo, my young Croatian hot prospect on loan with an optional future fee of 80M got two assists. Also we got debut goals for academy products Tahith Chong and Mason Greenwood. With the strongest team rested and ready for the big derby clash against Liverpool, we started off the game with another Paul Pogba goal who scored a rebound off a missed penalty but then Milner pulled on back for Liverpool before half time. Encroaching deep into the game now, Milner scores another goal which proved to be the winner in the 66th minute. It's a bummer but we played away from home against top of the table and don't worry, next time we'll get them . Also Eric Bailly got a red card in 85th minute which crushed our comeback hopes . My defence is slightly shaky since we tweaked our tactic but that's expected when you play two teams that made the Champions League final in the past 2 years. Luke Shaw is impressing though. In midfield Pogba is in hot form while in attack only Andreas Pereira and Romelu Lukaku stand out. 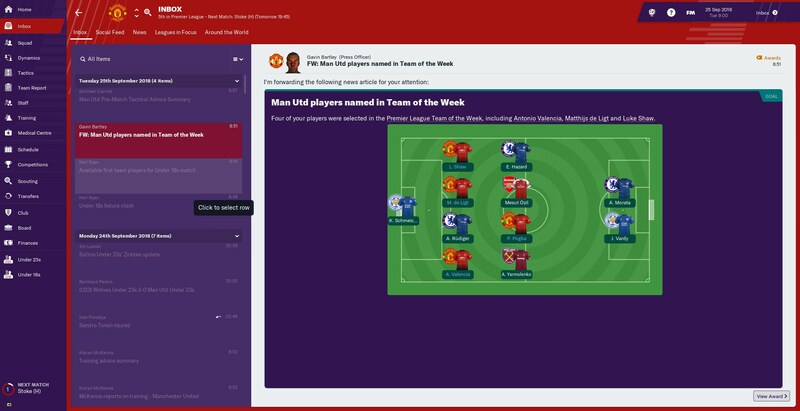 Looks like my defence impressed as Valencia, de Ligt and Shaw all made team of the week while Pogba deservedly makes the team in midfield. 8th is not where I wanted to be but we're making improvements with our newly tweaked tactic and I feel confident we can make top 2 in a matter of weeks and hopefully if we play extroadinary, we can take Liverpool out of 1st place. I'm happy you're giving Perreria a chance in the first team! 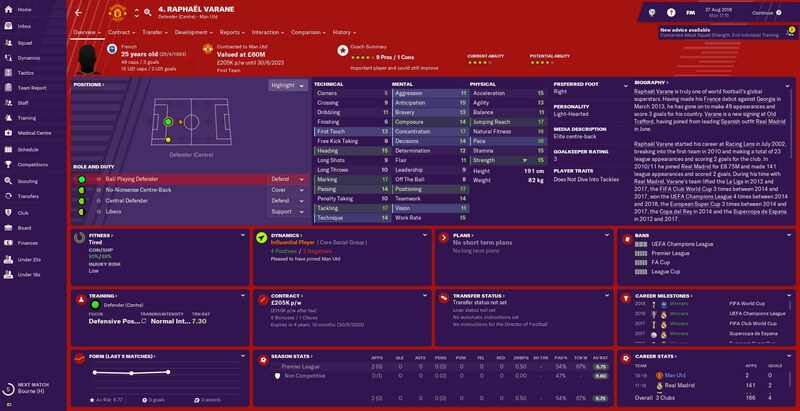 He's one decent prospect! Like you said, 8th isn't ideal but I'm sure you'll rise quickly once the tactic starts firing! 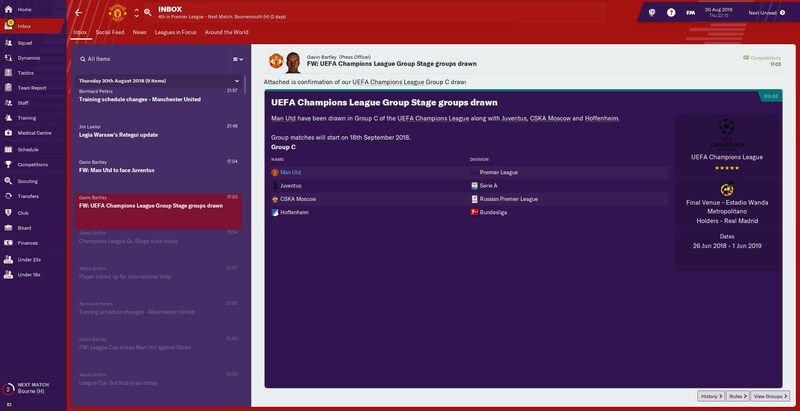 Kind Champions League group indeed. As tongey mentioned, nice to see Pereira playing - I like the guy in real life, deserves more minutes from Mourinho. With out newly tweaked tactic, our form is still showing as we smash Hoffenheim 4-0 in the Champions League to begin the month which involved a Romelu Lukaku hat-trick. We then beat Burnley 4-2 as we put on a great attacking display for Old Trafford but give a boring display in a 0-0 draw away from home despite having an extra man from the 36th min. We then beat CSKA Moscow in a good 3-0 win and we welcome Man City only for Alexis Sanchez to score a double and prove to them that they should've signed him. 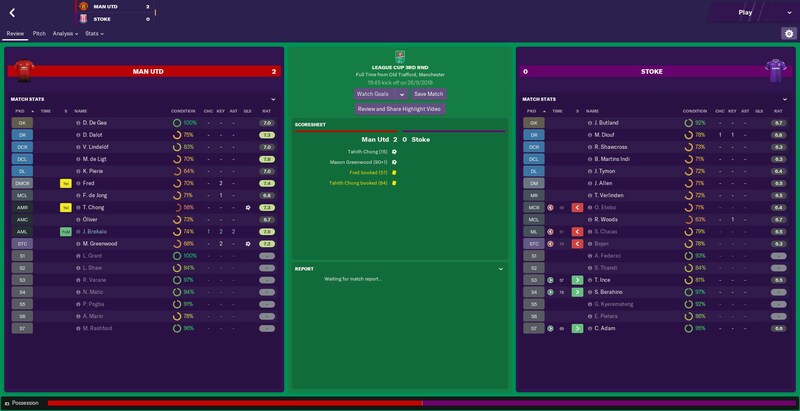 In typical Football Manager scheduling, we coincidentally (totally coincidentally) draw Man City in the League Cup right after a Man City game (very coincidentally) but all we needed for that game was a 1-0 win away from home to advance to the quarterfinals (hopefully we can get a cup trophy this season!). Four of the six matches play, de Gea managed to keep a clean sheet while Varane has proven to be a quality signing outside the EPL. Baily and Lindelof have been going fine but Shaw has been outstanding while Dalot and de Ligt impress. Matic, Tonali and de Jong have been playing well while Pogba has been outstanding with 5 goals in 9 starts but Fred hasn't been impressive and is not playing like a player you'd get for £40M. Up top Lukaku and Pereira have been on fire and they're our stand out players clearly. Rashford is starting to play better while Alexis has been going good but Martial has been a bit underwhelming. We had a good month where Dalot and I made top 3 for young player and manager of the month respectively while Axel Tuanzebe tears it up in the EFL Championship as he scoops player and young player of the month. Alexis Sanchez makes the team of the week while Dalot, Shaw, Matic, Lukaku and Valencia make it in for other weeks. We're only 5 points behind 2nd but we're going to have to get some games on Liverpool as they're 9 points ahead of us. Decent month there! Liverpool are storming the league so far! We had a pretty good month as we won all of our matches except for the first one in which we drew with Newcastle United away from home. 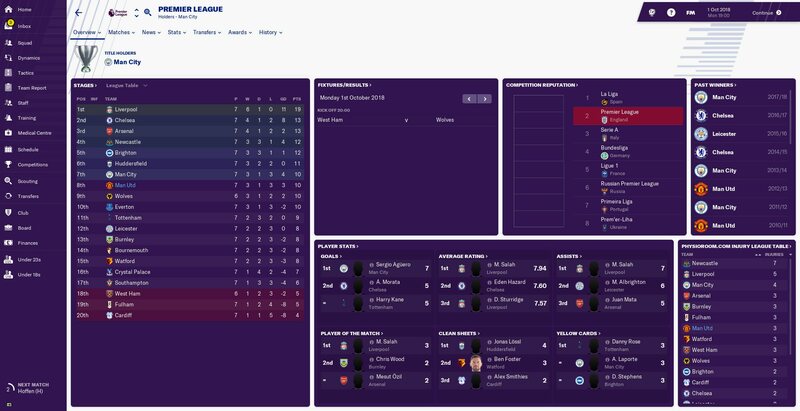 We did manage to top our group in the Champions League with our 2-0 win over CSKA Moscow and our impressive 2-1 win against Juventus. In between those games we recorded 2 clean sheets as we beat Fulham and Leicester, respectively. Following our good month, we're kind of in the top 4, although Man City have a game in hand in which they win, they will overtake us. It's also nice to know that De Gea has got the 2nd highest amount of clean sheets so far. December has been a very exhausting month as we've had to battle with playing matches every 3 days and in the end, it has resulted in a lot of unfortunate situations. We had to start with two very tough games against both of London's teams. We got extremely unlucky with the Arsenal game as our players inconveniently decided it was the best day to miss TWO penalties when we're playing Arsenal and are losing. In the Tottenham game, we tried to bounce back but all we got was a Marcus Rashford brace, a performance which started to catch my eye. We then showed our quality in a neat and clean 3-0 win over Crystal Palace in which youngster Tahith Chong followed an Alexis Sanchez brace. We did start hitting a patch of defensive insecurity as all we got from our Hoffeinheim game was a 2-2 draw while we could only get 1 goal in our draw with Wolves. We did advance to the League Cup semi-final after our 2-1 Burnley win which will hopefully help us extra in our job security. A 1-0 win over Watford followed while Rashford and Chong got more goals in our disappointing 2-2 draw with Huddersfield. In our final game of the month at home against Brighton, young Croatian winger Antonio Marin showed his qualities as he got a brace while Pogba's goal helped us get the narrow win. 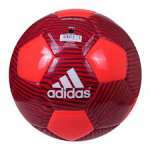 This year it has been the maestro Lionel Messi who took out the title as the world's best player this year. He beat the other candidates such as former teammate Neymar and Isco from his most despised team, Real Madrid. It's a shame that no Man Utd player got to win but what can you expect as we haven't shown any good form while Trent Alexander-Arnold of Liverpool definitely has. This year's world eleven is heavily influenced by Barcelona players with a mix of Real Madrid and Man City players. You've got the German goalie, ter Stegen who's defence is protected by an El Clasico Spanish defenders with Pique and Alba on the left half and Ramos + Carvajal on the right side. In midfield, you have the combo of Kevin De Bruyne and ex-Liverpool player, Philippe Coutinho. In attack, it's Salah and Messi out wide while Isco is behind Aguero. The only thing that is missing from this side is the fact that Neymar is missing considering the fact he came 2nd in BOTH the FIFA Ballon d'Or and the FIFA World Player Of The Year. Unforunately, none of our players made the substitution bench either. Messi also wins this accolade as Neymar is runner-up, just the difference this is to the Ballon d'Or this year is the fact Ronaldo came 3rd.